FOR CARPENTER BEES, WASPS, HORNETS, YELLOW JACKETS COUNT ON CJB PEST FOR THE BEST SOLUTIONS. GUARANTEED! Carpenter Bees look similar to a bumblebee but are larger, faster, and nest inside wood surfaces. They are very noisy and intimidating. The species will rarely sting but will do substantial damage to wood surfaces by boring out perfectly round 3/4 inch hole and then creating horizontal tunnels within the wood to lay eggs and nest. We treat the individual holes for elimination and treat the rest of the wood surfaces vulnerable to nesting with a repellent to prevent future nesting. Season-Long GUARANTEE. Structures such as gazebo’s, gondola’s, sheds, and decks are susceptible to carpenter bee’s as well. Carpenter holes also attract woodpeckers, creating additional damage to the wood. Paper Wasps are the most common stinging insect in Michigan. They are most active in May (first peak season) and August. (second peak season), Common nesting spots include soffits, under and behind gutters, roof peaks, deck railings, behind utility boxes, window/door frames, and small voided areas. Our “Preventive Wasp” service eliminates all the current wasp activity, knocks the nests down, and treats ALL the other areas they will attempt to nest on. This will GREATLY reduce the overall activity around your home as well. 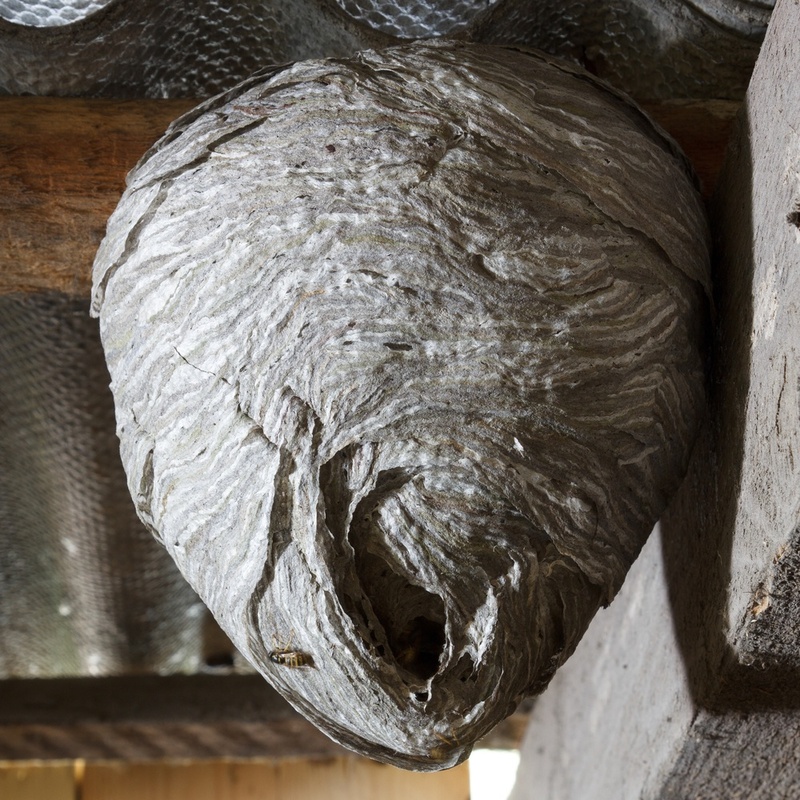 We provide a Season-Long GUARANTEE and inspection report to let you know what needs to sealed to prevent void nester’s like yellow jackets and honey bees. The hotter it is, the more active they will be. By August the nests are fully developed and the wasps will become more aggressive due to a change in their diet. In the family of Wasps, Hornets are the most aggressive stinging insects. They will attack when provoked, threatened, or for no reason at all. Nesting begins in mid-July and are active until November. Hornets build a paper ball nest (see pic) ranging in size from 6 inches to 30″ round. Hornets can construct a nest the size of basketball within 7-10 days. Trees, roof peaks, deck overhangs, and corner soffits are all common nest locations. We will eliminate the nest and remove it from the house or tree. **Prevention can be done to the home for the season with our “Preventive Wasp” treatment. Yellow Jackets are very aggressive stinging insects when they are provoked or threatened. They also can sting multiple times. Loud vibrations or noises will provoke a yellow jacket as will disturbing their nest. Yellow Jackets are void-nesters. They will either nest in a void space (wall voids, between floors of homes, crawl space voids) or in the ground. A Yellow Jacket nest can be detected by observing their high activity throughout the day. Yellow Jackets will be active starting early in the morning until dusk, they will be seen going in and out of their nest opening all day. If you see this opening – DO NOT SEAL IT, this will force them to backup into your home or business. Yellow Jackets should only be dealt with by a professional. All nest elimination is Guaranteed.